UNA offers daily walking tours of the beautiful campus located in historic downtown Florence. Tours begin at Coby Hall, located at 459 N. Court Street and will be led by a member of the LaGrange Society, UNA’s official student ambassadors. Potential students will have the option to visit Housing & Residence Life and schedule an appointment with an admissions counselor. *Please allow approximately two hours for your visit. Group tours are offered for groups of five or more 9th-12th grade high school or community college students. The visit includes an information session led by an admissions representative and a walking tour of campus led by members of the LaGrange Society. Click here to request a group tour. Students can register for upcoming events through their MyUNA account. Can’t make it to campus just yet? There’s good news—we’re hitting the road to visit places near you! Designed for high school students and their families, Paint the Town Purple: Huntsville is a great way to learn the ins and outs of life as a Lion. 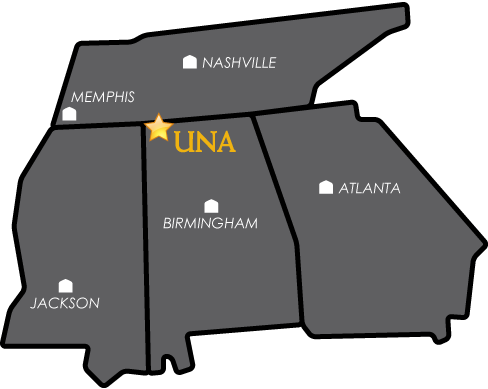 Don't miss this opportunity to visit with members of the UNA family and to learn more about North Alabama's academic opportunities, student life, and affordability. Dress is casual, and light refreshments will be served. We hope to see you there!